Stop the posturing and outburst. Questions are aplenty, but here’s the supreme one: Have we reached this far in overcoming major obstacles for the Mayweather vs. Pacquiao only to be impeded by boys who squabble over chocolates and cookies? Can the fans allow it? Will you quit running a race if the finish line is just few steps away? What treasure hunter is a man who stops digging massive gold with less than a meter deep left to bulldoze from where he stands? And what about a boxer who is winning by a wide margin but throws in the towel with only seconds remaining in the final round? How giant networks are dwarfed? Do the boys of HBO and Showtime deserve a biblical rod? Pac and Floyd are ready to rumble. But hey Bob, why fume and sabotage the entire negotiations over the “urgency” of the fight schedule by ranting in media? Cinco de Mayo is just a “proverbial” date for a sport not exclusive to Mexicans. Is May 2 more important than the fight itself? Fact is, the Mayweather vs. Pacquiao can be moved to a later date, if need be, for as long as the boxers won’t engage in any other fights prior to them fighting each other. So what’s the fuss about? Who needs Bob’s Harvard to know the alphabet? Arum’s wrath and exaggerated comments don’t reflect the true picture of what’s going on in the discussions among their representatives. They reflect his intentions. The talks are yielding results contrary to reports or rumors, though not as fast as Arum wants. There have been positive movements, but Bob is an impatient octogenarian. His public tantrums must be ignored because no one knows for sure what’s at back of his mind when he blurts out words. Everyone is willing to wait but Bob. He decries “lack of urgency” in the negotiations, but the world decries his restlessness and lack of composure. Arum roars, “Nobody’s listening to anybody. I have no idea what’s going on to happen. I’ve never been through a situation as crazy as this. I’m tired of it. I’ve negotiated for 50 years and I’ve never been through some s-t like this. It is craziness. It is just crazy. If you know what was going on, you would know how bizarre it is.” Oh, bizarre and crazy indeed are Bob’s actuations these days. Be still. Arum is again showing signs that he doesn’t want the fight. 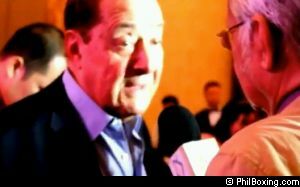 Hurry up finalizing the deal, Floyd, sign the contract and so beat Bob Arum. Without regard to pressure from a childish promoter, HBO and Showtime must set aside their own boyishness (or selfishness) to get their acts together ASAP for the Mega Bout to materialize soonest. Otherwise, “pay-per-views” and “replays” for each network’s shows in the future might altogether be rendered useless and bankrupt via People Power, till the Armageddon of boxing happens. What makes a winner win, and a winner lose?